Gene Black an Alabama Artist and Quilter: the ?? Sisterhood ?? 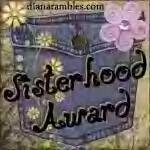 Award ---This Brother is honored. Oh, gosh...there will be nobody left for me to pick soon. Barb gave me the award, too...and I was trying to think who to give it to (as she also had awarded some I'd have chosen...like you) and now you have picked some I'd have chosen). I may just have to award it to EVERYONE!!! I think that's just what I'll do! My goodness, I'm so honored. I hope I can do all this stuff. I still haven't figured out how to do a link. Well, off I go. Thanks, bud.